Acupuncture and TCM (traditional Chinese medicine) treatment to prepare for, and to assist in conception is important to promote successful implantation and reduce the chance of miscarriage (both male and female treatment) by promoting the growth and development of healthy eggs and sperm, thereby leading to a healthy embryo. Treatment also tonifies and regulates Qi and Blood in the fallopian tubes and uterus, and nourishes the foetus in these early development stages. This section refers to the use of acupuncture and TCM for recurrent miscarriage, i.e. miscarriage that has occurred twice or more, illustrating a potentially habitual condition due to some internal dysfunctioning, and this can be a cause of the male or female, or both. When miscarriages are due to a known cause, e.g. uterine and/or cervical problems, they can be readily identified by Western medicine where drug treatment is available. However, in the majority of cases, miscarriage is due to issues between the uterine environment and the foetus, or can be due to fundamental aspects of poor egg and/or sperm health which inhibits early growth and development. In these "inexplainable" cases, or if you prefer not to undergo the pharmaceutical drug route, acupuncture and TCM can be very effective to treat the condition by way of identifying and treating the underlying causes and thus preventing it recurring. If you have a history of miscarriage and would like to know more about how acupuncture and TCM can help you, book an appointment at one of our clinic locations, or contact us for more information. PArt of the holistic treatment of Acupuncture and Chinese medicine will help to prevent an ectopic pregnancy from occurring. However, if you have already experienced an ectopic pregnancy, it is important to address the issues concerning why it occurred and to treat the cause to try and ensure it does not recur. Tension in the muscles of the tube. Certainly, if you have a history of infection in the fallopian tube(s) it is very important that you undergo a laparoscopy or HSG test to check if indeed there is any obstruction. If obstructions are present, acupuncture and Chinese herbal medicine is very effective at flushing and clearing the tubes (see also Gynaecologial Disorders > Fallopian Tube Blockage); if the tubes are clear, and there is more of an "inexplainable" reason for the ectopic, acupuncture and Chinese medicine treatment would involve regulating Qi and Blood flow and ensuring the Yin body fluids are abundant to encourage the natural movement of the embryo through the tubes into the uterus. If you have a history of ectopic pregnancy and are looking to try for another conception, start some treatment as soon as possible to address the cause before trying to conceive again. 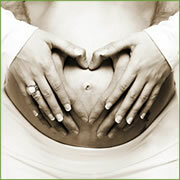 For more information about Acupuncture and TCM during pregnancy and beyond, see Acupuncture for Pregnancy and Post-natal Care.